The Southwest Principal Aquifers consist of many basin-fill aquifers in California, Nevada, Utah, Arizona, New Mexico, and Colorado. Demands for irrigation and drinking water have substantially increased groundwater withdrawals and irrigation return flow to some of these aquifers. These changes have increased the movement of contaminants from geologic and human sources to depths used to supply drinking water in several basin-fill aquifers in the Southwest. 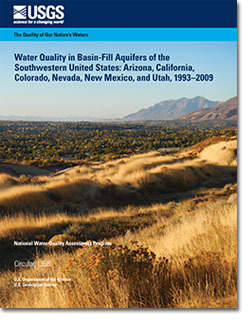 Thiros, S.A., Paul, A.P., Bexfield, L.M., and Anning, D.W., 2014, The quality of our Nation's waters—Water quality in basin-fill aquifers of the southwestern United States: Arizona, California, Colorado, Nevada, New Mexico, and Utah, 1993–2009: U.S. Geological Survey Circular 1358, 113 p., https://dx.doi.org/10.3133/cir1358.